Now accepting submissions at theflowgallery.com! 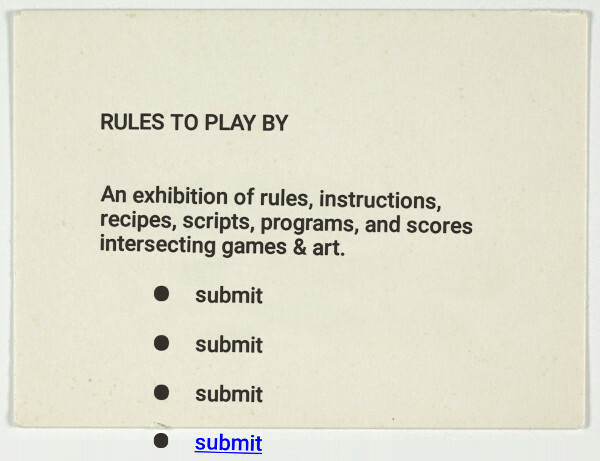 I am co-curating, with Brianna Shuttleworth, an exhibition of art/games inspired by Fluxus scores, surrealist games, instruction art, etc. The exhibition will be held in two locations during the weekend of July 27–29, 2018 in St. Louis, MO. One location is a popup art gallery. The other is within Pixelpop Festival. This is the first exhibition in The Flow Gallery, a series exploring the intersection of art & games.